It was the beginning of a typical rainy day in the busy city of Hong Kong. The sky was grey and gloomy, the drops were fine and dense, and the streets were bustling with people hurriedly jogging to cover. My two close friends and I however, we were looking for a high vantage point, a place to overlook the scene that was unraveling in front of our eyes. We spotted a short building directly in front of SOGO, Hong Kong's Japanese supermall. We made our way up the stairs that were littered with trash bags, breathing in second hand smoke that was seeping out of the e-cafes situated in the building. When we got to the last floor, we were greeted with a pleasant surprise: the fire door to the roof was unlocked. We creeped it open, making sure to not set off any alarms, and set foot onto the roof. As we made our way over to the ledge, we were slightly dissapointed. The large buildings infront of us towered over us and blocked our view of the city. Sigh. Another failed mission. Ultimately, we decided that the spot wasn't worth it and started to make our way back to the fire door. Right as I was about to pack my camera, I looked straight down over the ledge. I was mesmerized. 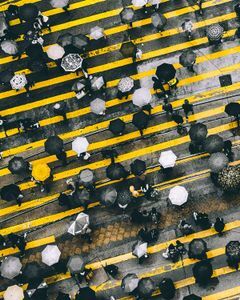 Hoards of Hong Kongers were starting to cross the famous Causeway Bay crosswalk, armed with umbrellas and rain boots. The yellow zebra stripes under them glistened in the rain. I ripped my camera out just in time to capture the magical moment. Success.